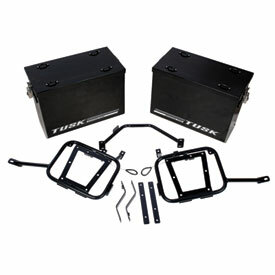 The Tusk Aluminum Pannier Boxes are designed and manufactured to handle the most extreme adventure motorcycling. These panniers are loaded with features to offer an unbeatable value! These panniers are made from durable yet lightweight aluminum with a tough silver or black powder-coated finish. Not only do they look great, but they prevent the items you store from getting the black residue produced when rubbed against unfinished aluminum. Unique design that eliminates seams on the back two vertical edges (weak spots on other panniers), and all existing welded seams are reinforced with internal stitch welds. For security and convenience, the boxes come complete with 4 (2 on each box) matched locks and keys already assembled on the latches! A rubber gasket at the top of the box ensures the lid is tight and waterproof. Each lid comes complete with 4 bolt-on footman loops to secure additional items. Each Large box is 37 Liters and measures 15 ½" tall, 9 ¼" deep, and 18" wide. 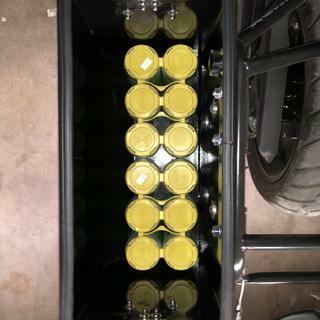 The Medium boxes are 27 Liters each and measure 14 ¼" tall, 7 ½" deep, and 16 ¼" wide. This is a complete kit with all the mounting hardware to outfit your bike for the next adventure. Complete kit with a pair of Aluminum Panniers and Pannier Racks with all the hardware for mounting. Durable aluminum panniers that offer an unbeatable value for adventure motorcycling. Powder-coated finish looks great and protects items from unfinished aluminum "blacking". Seamless rear vertical edge design and reinforced welding ensures strength. Complete with 4 (2 on each box) matched locks and keys assembled on the latches. Aluminum lid is completely waterproof and features 4 bolt-on footman loops to secure additional items. Each Large Box is 37 Liters and measures 15 ½" tall, 9 ¼ deep, and 18" wide. A pair of boxes gives you 74 Liters of storage. Large box opening measures 16 ½" Wide x 7 ¾" Deep. Each Medium Box is 27 Liters and measures 14 ¼" tall, 7 ½" deep, and 16 ¼" wide. A pair of boxes gives you 54 Liters of storage. Medium box opening measures 14 ¾" wide x 6" Deep. Aluminum is .085" thick and each Large pannier weighs a little over 11 lbs., while each Medium pannier weighs just under 9.5 lbs. Pannier racks feature cable operated Quick Release pins. Used these as a replacement for the soft saddlebags I had been using. The amount of space is phenomenal. No noticeable effect in handling. Love the fact that these are waterproof as well. First of all, this is a solid rack and set of panniers based on my review of just the gear itself. I haven't traveled with it yet but the materials and construction seem very simple and strong. The installation was more than I expected, not due to ability, just didn't know it needed this much drilling and fitting. That said, it does give me the ability to set the panniers just where I want them. Be prepared to spend 20-minutes putting the latches on the cases and up to half an hour to get the bars mounted. Ease of Installment = 3. As to the fit, the rear-most foot of the left rack was off by 1/4". Several hearty whacks with a deadblow hammer got it in line and, the other three landed on their marks just fine. 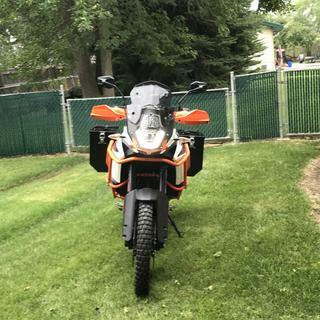 Here's my biggest complaint: The crossbar does not fit my 2018 KTM SAR in the orientation depicted in the instruction photos. In the photos, the bar should run across the top, just under the tail of the seat. That may work on the 1190, but not on the 1290. On the 1290, there is a V under the tail section which does not allow the cross bar to mounted as per the picture. I just flipped it so that the crossbar is now along the bottom of the bracket, and, although it doesn't sit directly inline with the exhaust, it will probably pick up some heat from it. I went ahead and gave it five stars because the amount of cash savings, over the Touratechs and others, more than makes up for any little inconveniences tied to the one-time that I will install these. Nice to be able to carry all my gear, easy to install as well. 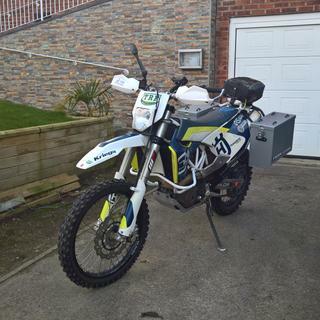 I have been running a set of the Tusk pannier racks on my KLR for several years now and they have worked really well. So, when my son needed a panniers for his dual sport, I had no hesitation recommending the same for hm. I think I'm on my third set of these boxes. They're solid and inexpensive. They take abuse. Simple to install on the Tusk racks. If you opt for the pannier handles, get some protective tape for the lids. The plastic handles will beat up the finish if you don't. I used "saddleman protective tape". As to the durability...I saw one on a friends bike depart his bike on a dirt road about 50mph. He forgot the security screw. The thing looked like a skip bomb bouncing along the road. No damage. Saw another set after another friend dumped his bike at speed off a highway. After a little metal massaging you couldn't tell the pannier had taken most of the hit. My only comment about the ones I just put on mine...the medium probably would have been big enough. These things are huge. Great value for the money. Added bonus; if you buy the Eagle Mike drill through subframe bolt upgrade kit, it comes with the 11/32 but needed to drill mounting holes or the tusk kit. 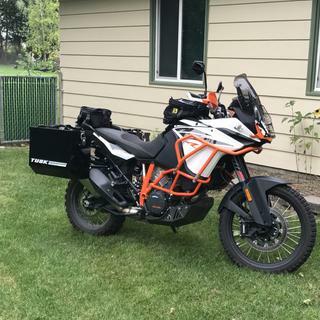 Bought these panniers for a 2018 KTM 1290 SAS. I wanted more storage, but just couldn’t bring myself to spend $1k -$2k for them. These tusk panniers are a great storage solution. They are secure, well built, and you can’t beat the price. They are fairly easy to install. I would highly recommend them. I went with the medium size ones and they are perfect for my needs. Love them. Not too difficult for install but I watched the video. The paper directions were tough. It took me four hours which was a lie. I would have never guessed that you could get a set of panniers for around 400 bucks. Especially given the fact that it includes the mounting hardware. I would suggest using some rubber washers to make it more water resistant. Everything about these panniers are great. Easy to install, tough, size is great. I'm very disappointed with Tusk though, because I found out when I went to finish installing the lids they did not finish packing the kit with the keys to the box. So without the keys I cannot finish installing the lids as the locks won't open to allow me to attach them to the box. As well as the obvious, lock the boxes once installed. Three stars due to the oversight on the manufacturers part. My only gripe is the weight, but that’s the price of durability and security. These are very nice boxes and mounts for the money. The Large bags have great space and waterproof! I did lose about 5MPH top speed. They push a lot of wind, but didn’t seem to affect the overall handling of the bike on the highway at speed much to speak of. Overall I’m very happy with them and the value. The fit was good. Assembly can be a little tedious but worth the time investment. Watch a video and the assembly steps will be clear. You can judge for yourself the value vs time need to assemble is worth is for you. Customer Service was Jonny on the spot with a replacement part for the pannier box mount. I think one of the best presents I bought for the bike ?? and me. 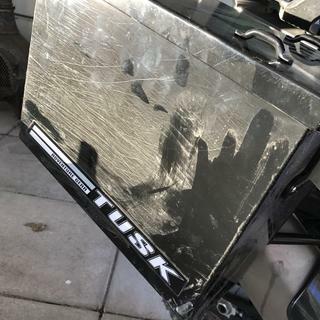 Crashed my '99 KLR 650 and kind of destroyed my ammo cans I had mounted. 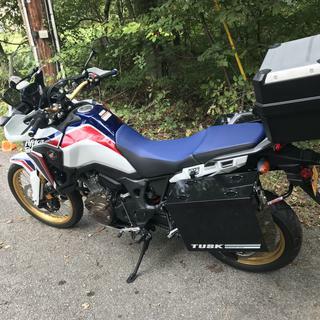 Upgraded to these tusk panniers and man does it look so good! Also, lost about 10 pounds upgrading to these. The large is the way to go! I installed this set a little over a year ago so figured I would write a review now. The quality of the racks and panniers are very good. The racks did not fit perfect upon installation, they did have to be "tweaked" a bit to fit. That being said, once the racks were mounted the panniers fit well. You do have to fit and drill your own holes in the boxes to fit and there are many tutorials out there on how to do it. I did find that you need to go through all of the pannier hardware and "fix" them. I removed the hardware on the lids and added rtv before reinstalling the screws and added blue loctite. A also had to have RMATVMC send me out another set of locks as one came apart. On the replacements I also took apart and put back together with blue loctite. Other than these minor details that are easy to resolve and fix, the quality and durability has been great. They are now weather tight and have held up to all kinds of weather and a couple of laydowns. A few scratches here and there but no dents or broken welds. I highly recommend. Very nice product, fit, finish, easy to install. Very impressed for the price point. These are great for the money. The install is pretty clean, and the boxes work well. They're heavy and obviously don't have the quality of finish you'll find on much more expensive boxes, but they work. They can also take a beating! 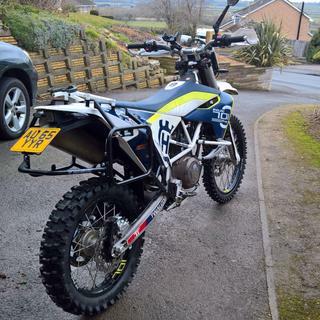 put them on and take them on when you don;t need them, the tusk brand seems to be a good fit for the KLR, very happy with them. 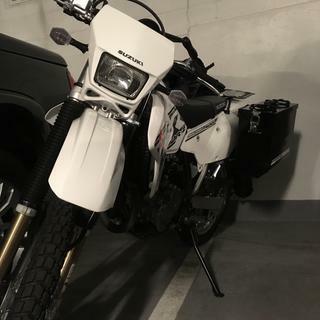 In end they fit my 2018 klr650 nicely. Some minor modification was required for installation and the YouTube video is not accurate. The lid edges are sharp and cut your fingers. I bought these medium boxes for my wife's bike. I purchased the large ones for my bike. We love them especially with the tusk liners! It's great to be able to organize all your stuff in them. I mounted them low to have a low for center of gravity and we don't hardly notice they're there! We took a trip from Boise Idaho to Eastern Oregon this last weekend and we were able to pack everything we needed! Great panniers for the money I'd recommend them to anyone, not a big grip but I wish the lids were hinged otherwise we're very happy with them! I bought the medium boxes for my DRZ. They fit nicely and I’m happy with the decision to get medium versus large. These along with the Tusk top rack are an awesome look. I highly recommend. Take your time with the installation as far as measurements are concerned. It’s not as bad as it may seem just takes some time. I used blue loctite on all bolts used on these boxes and added red to the large threads of the lock mechanism as well as red loctite to the Phillips head screw used on the lock. I read reviews mentioning those areas vibrating apart so I figured I’d stay ahead of things. Overall, very great product especially at the price. 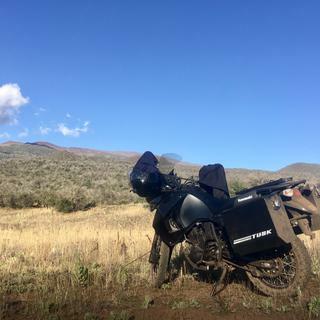 Recently purchased an African Twin DCT and an adventure bike isn't complete without luggage. I sprung for the Tusk rack setup due to thier ability to accommodate hard panniers or soft luggage. Other luggage rack manufacturers' racks can also accommodate both luggage types, but they don't come as a package deal. You will end up paying out an additional $400-$1000. With Tusk, $400 will get you some great racks and panniers/bags. Install was easy and strait forward. If installing on the Africa Twin be careful drilling out the rear bolt holes, the turn signal wire lives back there. The racks installed easily and without fuss, I did no t need to muscle any parts to fit. The panniers themselves took more time. I was very meticulous to ensure I put blue thread lock on everything (ecently the footman loops bolts and also the pannier locks. It was a pleasant supreme to find that all 4 locks were keyed the same. 1 key- 4 locks, SWEET! The finish on the black panniers is very nice. And adding the pannier handles will make transporting the panniers a breeze. Looking forward to stuffing them with gear and heading out for some camping adventures. Bought the combo kit to save money. Install can be a bit of a pain to install. Just take your time and follow the instructions. The med. boxes will carry a 12 pack of drinks. I installed these on my 2017 KLR60. Lots of holes to drill but overall an easy install. I've had them on for about 2 months now and they are well worth the money for a daily rider. A moped decided to pull out in front of me resulting in a T-bone type impact at 45mph. Me and the bike slid down the road a good 25ft. The boxes took most of the impact and kept my leg from being pinned and the boxes held up great. 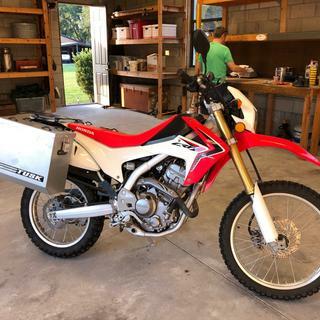 I purchased the set for the 2017 Honda CRF250L Rally. Even though I actually installed them on a 2014 Honda CRF250L (not Rally). After looking at the manufacturer parts diagrams, it looked like the back-end on these two bikes is identical and so I felt good ordering the product. Rocky Mountain should probably update their website to show compatibility with more years and versions. Anyway, they look awesome on the little Honda...Took them for a test ride and no noticeable handling issues, rattles or speed reduction. Very tough and well made. Have to remove when cutting traffic in city areas as there too wide , but for long trips very awesome. Tusk saddlebags 27 litres fits just right! Discreet yet offers protection like a crash guard. 27litres offers me what I want without becoming a fatso. Now all I need to do is come up with a way to take the shine off without loosing the colour! Say hello to my two little friends! I put these on a 2012 DR650. Very solid construction, all pieces were there which made for an easy install, took 3-4 hours. 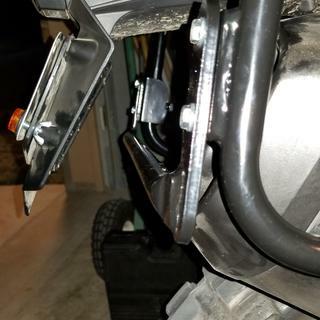 There was a small rush spot on one of the brackets that attaches to the foot peg holes, easily fixed with some paint but that is the only reason I gave 4 stars instead of 5. These panniers saved my leg! They held up in a 50mph layover on a highway. Afterwards they still seal up and function properly. Would HIGHLY recommend them on durability alone. Plus they are very light, hold a lot of stuff, and are a pretty good bargain. After a 50mph layover on a highway curve they still seal up and function great a year later!!! I love them, the fit and quality of the parts were perfect. After watching a YouTube video about installation! it was a easy task. I would recommend them to everyone who has a dual sport. I have fitted the panniers to my bike now. They look great and feel like they will last for a substantial time. 2 - The rack only comes in black that is not obvious when ordering. Fitting the panniers is pretty straight forward however it does leave 3 bolts at the top of the fitting that will catch on luggage as it is taken in and out of the pannier. 3 - there are a couple of areas where the finish on the power coat is not perfect. Overall pleased with the result and reccomend them. Great price and quick delivery to Australia. I was surprised to see two boxes 'made in china' but I guess for the price that's what you get. Packaging of the racks was excellent but the panniers was barely adequate with the thin polystyrene smashed to pieces and one of the panniers had the black coating scratched off in one of the corners. The weld quality is average to poor however they don't look like they will fall apart any time soon. It would have been nice to have a 19mm and 8mm drill bit included as these are required for installation. Overall a good priced product and value for money. If you want a top quality product you will need to spend a lot more. Easy to install, look nice for the price and don't seem to affect handling. I only have 50 miles with them so far. If you're willing to pay 70% + more for panniers and rack for your bike, I get it. Been there, done that. Is it better quality? Probably so if you looked into it very closely. Is it worth the difference in price? Guess so, I justified it once and bought a set of those $1800 bad boys from somewhere over round Germany maybe. And without a doubt, they make some real nice quality stuff for sure with a "name" stamped across every flat spot of each pannier that's instantly recognized for quality around the world. Kinda like, "I have arrived" if ya know what I mean? If that's the direction you are kinda aiming, go for it, pull the trigger if you can justify the price, I don't think you'll regret it. You can stop reading now. For those of us that don't have world travel aspirations but love to get out in nature for a few days at a time, ride the forest service roads and do some two track exploring type stuff, I highly recommend this Tusk product. Had one small quality control issue with right rack hole alignment, was off just under 3mm no matter which bolt was slightly threaded first. Yes I took pictures during install. Quick fix to elongate slot. Also, the install instructions highly recommend having another set of hands there to hold the panniers in position while you mark the holes that you have to drill to mount quick disconnect mounting plates. I did not have anyone help me with this install. I'll be 63 in a couple months so yes it can be done solo but much more time consuming as you'll have to take very detailed measurements and be patient. That's the reason I gave it a 3 on both ease of installation and fitment. Now to the good stuff! These things are more than plenty rugged, welds and powder coating are top notch, weight of the boxes feel very light yet have Zero bend or flex, rack structure completely stiff, no flex solid mount, hardware and latches are very nice looking, locks work perfectly one key for all four locks and a 2nd key for you know what. Now for the crash dummy part....Yep, because thread lockers need time to fully "cure", I waited for the next day to do the shakedown run, VERY impressed! These things don't make a sound, not a rattle, not a sound, fully loaded or not doesn't matter, I forgot they were there a few times and got away with it. 2nd ride with these on the 1190 we were supposed to be on FS and fire break roads but things happen and found ourselves working thru a forest not even on a path and I whack a tree with the right pannier at very slow speed but fast enough that it woulda face planted me on the left side had my front not been in slight rut to the left. Again, I'm very impressed. The lock was the first thing that came into contact, it and the upper front of box was pushed back maybe .500-.625" and tearing one corner of lid which I've straightened out with a small polymer dead blow hammer. On the pannier, I haven't tried to pound it back out yet but think it'l work out fine. The lock, latch still work perfectly and guess it still seals pretty well too since didn't see any water in box after washing. 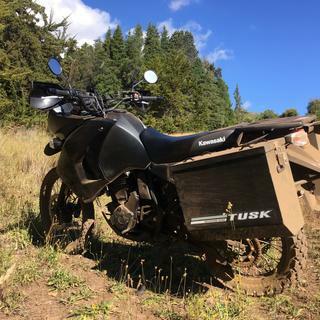 I haven't dropped the pig on a rocky trail yet but have been down on both sides in sand/clay,,,again, solid product, nothing, no bending flexing denting of either box. Easy on and off, just loosen internal knob lock, pull pin back, lift off bike, back on just as easy. Here's the deal for me, now I know the quality of this product, if for some reason i cant repair this box I damaged to my satisfaction, I'm very OK with being able to order another complete pannier & rack set up, Same of course, to pay for my error,,,and still have less invested in total than what one pannier may cost elsewhere and that's gonna give me a complete back up set of any thing else i might try to tear up down the road. That's way cheap insurance from where i'm sit'n especially given the fact that on many exploring rides the terrain can change drastically in just a mile or two and when that damp clay covering slick stone gets a little thin and wet it can interesting in a hurry on a these 550-700 pound ADV bikes. Think I better go ahead and order my 2nd set now. IMO there is no other major accessory product made that can deliver a better bang for the buck. Awesome product. Hope this helps and if I've confused anyone, it happens, my mind doesnt work very well anymore, I'll just say this, you're either in the first group or the 2nd. If you're in the 2nd, i highly recommend this product. Well, first of all you can't beat the price for aluminum panniers anywhere. They install fairly easy, I recommend watching the video on you tube the written directions leave a little to be desired. I have not used them on the road yet but they fit well. I feel Tusk should raise the price $10.00 and supply the handles for the boxes, who wants to release the box from the bike and have to have both hands to carry the box away awkwardly. I have had two sets on two bikes and they always deliver on quality and function. The locks are problematic and require healthy amounts of loctite and can be faulty and not truly lock. just spend extra time getting these installed and sheck that they work before mounting. I live in OR and the rain has never been an issue. Had them in under 24 hours after ordering. Fit great and look good. I was disappointed to see that they came in a box marked "Made in China". Soon after getting these in, I saw a gentleman in Washington State who was making a very similar item for about the same price in his garage. About a week after using these, one of the pins that holds the lock-lever in place (and together) popped off. I had to search the ground to find it, and shove it back in or the top would not latch. I shouldn't be having to fix something that is new. But, I also get some of my tools from Harbor Freight, so I know the saying "you get what you pay for". If the pin on the latch wasn't falling apart, these would earn a 5 out of 5 for value, and durability. The ease of installation earned a 4 out of 5 because I needed to drill the mounts, and the instructions were lacking on taking the bike apart. There was a youtube video that helped get the rating up to 4 out of 5.I hoped that they would have already been pre-drilled, but I understand that these are universal, and each bike is different. As far as fitment, they seem to fit just fine. 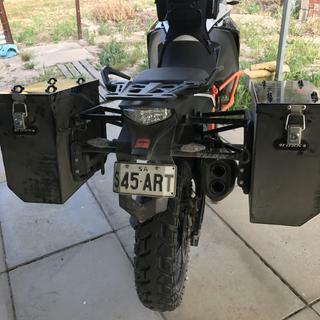 I ordered the medium set, as I did not want to have huge boxes hanging off the side of the bike and all the brackets for the mount lined up fine. 5 out of 5. Finish is fine. It's paint and not powder coat, but that does not matter to me because they are going to get beat up anyway. 5 out of 5. All in all, if these were made here in the states, I'd be much happier. I do recommend them to anyone who does not want to pay the ridiculous prices for an aluminum or stainless box offered by other companies. I'm not "unhappy" with them, but there needs to be some improvement to get them up to par. 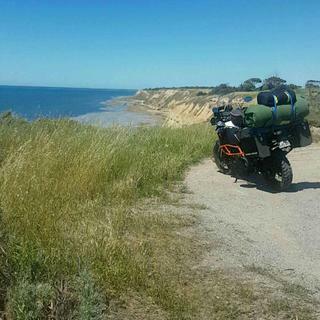 Can anyone please tell me the distance (width) between the outside of one pannier to the outside of the other using either of the Tusk panniers and racks on a 2008-2017 KLR 650? BEST ANSWER: They are 38" wide on the large panniers. When will these be Available for the Africa Twin? BEST ANSWER: At this time we do not have any information on when we will have this item for the Africa Twin. I will go ahead and forward this to our purchasing department for consideration. 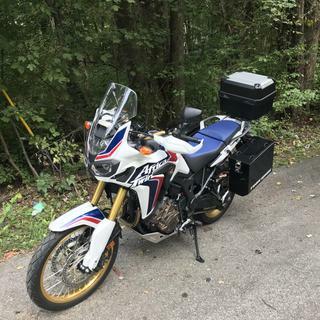 These panniers with racks are now available for the Africa Twin. 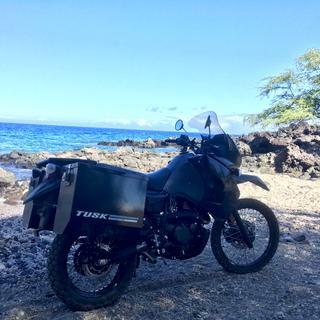 Can anyone tell me the overall width from the outside of one pannier to the outside of the other using the Tusk Rack and (any size) Tusk pannier on a 2008-2017 KLR 650? 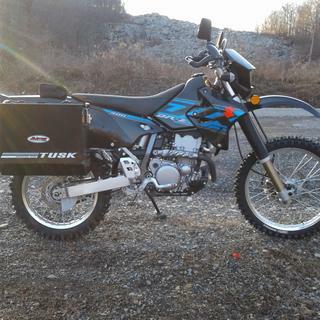 BEST ANSWER: On a 1991 KLR 650 the Large Panniers with the Tusk Racks measure 36 1/4 inches. I have a 2012 drz400s. Does Tusk make aluminum panniers and a rack system to fit this? BEST ANSWER: These are now available for the Africa Twin. You will just need to enter in your machine in the drop down boxes and it should pop right up. Complete set ordered and on backorder till May. Not a problem.Since I have your attention, I have a couple other questions. 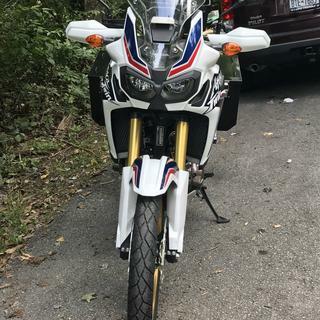 Would you have pictures fitted on a Africa Twin ? Are there any modifications needed ie... turn signals? Total weight with racks? Max weight allowed in bags ? Warranty ? Lengthy I know. Thanks in advance. Unfortunately we do not have any pictures yet with the pannier racks on the Africa Twin. There might be a couple on our instagram or facebook pages if you scroll back a little ways. There will not be any modifications that will need to be done to accommodate the racks. The max weight of the bags, I am unsure of but the racks themselves weigh approximately 20 lbs. If there is any manufacture defects in the racks or boxes, we will cover that under warranty as long as you have proof with pictures or video of what is wrong with them. I hope this helps! Let us know if you have any other questions. The video says each kit comes with the security knobs but then goes on to say they are an optional accessory. Does the kit includes the knobs? Thanks !! BEST ANSWER: Everything you need to secure the Panniers on the KLR is in the kit, the "Knobs" are a threaded knob you install inside of each box so no one can pull the quick release and take off with the box, but it also is added security in keeping the box on in real rough stuff in case the quick release were to let lose, I have 5 sets of these, and I can assure you that by far, the best set up for the money, I have one set of HT panniers and racks, at 1,200.00, they really are no better than the TUSK set up, go on, dive in, you will not regret it, only thing is, I wish that when I purched mine, the had the Med boxes, back then, they only had the large boxes. my 1st set has about 17,000 miles and still rock solid. 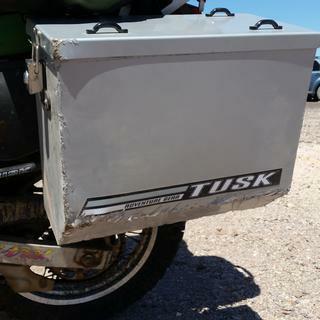 Terri C. When I purchased my set of Tusk panniers with the racks the security knobs were included in the packaging. I don't know why they would be an optional accessory. Perhaps they are stating that the choice is yours to utilize the security knobs. I recommend using them all the time. I would prefer not to though. Just one more process to go through to remove the panniers. If you cruise anything other than Carmack I would recommend using them to prevent rattling. Good luck with your choice. I like mine. Think I might like the smaller version they offer now. Merry Christmas. Bought my Tusk rack and panniers about a year ago and they came with security knobs. The carry handles are optional, but would recommend them if you want to take the panniers off a lot. Also, would recommend buying extra star washers for them, as I seem to keep losing them. Great panniers and rack for the money. My kit came with the knobs, it was purchased over a year ago though right after Tusk debuted this product. Just take your time lining up the mark on where you drill for the knobs. Yes, the kit does come with the security knobs. What the video means is, it is optional to use the security knobs. Yes the kit comes with the knobs. They also help tighten up the panniers from vibrating in the racks. Terri, When I purchased the kit it came with the security knobs without me asking for them. Yes, my kit came with the knobs. Great boxes. Won't get better for the price. Yes the kit did come with the security knobs. Very easy install. Yes the kit does include the security knobs. Yes! The kit comes with the security knobs. Will the larger size hold a full face helmet? BEST ANSWER: Although you can't fit the helmet in the box- the locking mechanism for my bike was moved to the rear pannier brace and works well. No, you cannot fit a helmet in them, the helmets are a little too wide for the panniers. Nope, won't hold a 3/4 helmet either. But it's not hard to bunjee it to the lids. I bought my panniers this year. No they are not large enough to store a helmet. No - helmet won't fit. 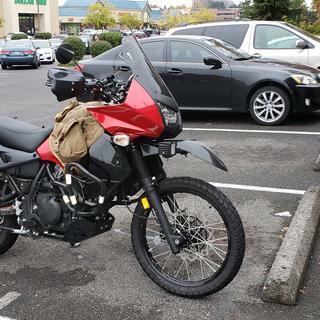 I own this rack and just bought TUSK Panniers for my dr650 It looks like they won't work. is this true? do I need to shell out for a different back rack now? BEST ANSWER: I have this setup on my DR650. The rear rack will need to be modified to allow the pannier rack to mount. I used a bench grinder to remove the excess material on the forward mounting points. I also had an issue with the rear pannier bracket interfering with the license plate. I made spacers to eliminate the interference. Not a simple install but not overly challenging either. 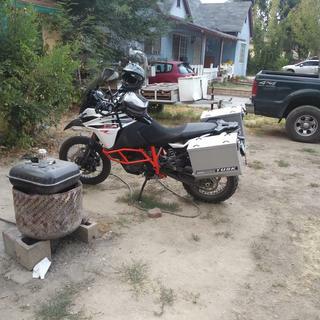 Sorry, I installed the panniers and racks on a KTM. But on that bike I was able to add a custom rack, so it may work. Good luck. No, I have this rack and the Tusk pannier system it was a little difficult to install but it fits? Do these side cases fit a Honda 700X? Can I use the passenger pegs with it? BEST ANSWER: Most definitely! Just have a passenger sit on bike before placing boxes onto racks. I just measured the distance back from peg for my size 13 shoe if it was on peg. My spouse rides with me on mine with the boxes on. Makes her feel more secure. Also I can put my feet on passenger pegs during longer stretches of straight highways as an alternate foot position. I measured hole layout and sent to my brother with same boxes and bike. Worked great for him also. Depends how you mount the boxes on the hardware. Since drilling the holes on the boxes for the bracket is a very permanent thing. I would suggest having a passenger sit on the back while you place the box where you want them and mark them. Box brackets might look funny since they will be far to one side, but no one will notice them, when the boxes are on the bike... and the box construction is plenty sturdy to support this. The panniers don't come with any predrilled holes, or a predetermined mounting location. It definitely takes some work and knowhow to get them mounted properly, but the nice thing about that is you can place them exactly where you want them. You can definitely mount them in such a way that still allows full use of the passenger pegs. I chose to do so on my bike, and they've been great. I went with the mediums, btw. 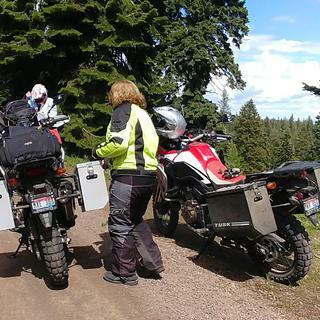 Yes, you can still have access to the passenger footpegs, and since you mount the rack on the back of the panniers your self you can add as much room as you like. I hae had two (2) Other brands of aluminum panniers these seem to be at least equel to any. And a lot less money. Yes you can still use the pegs. It depends on how forward or towards the rear of the bike you mount your bags. I mounted mine do that if I had to I could take a passenger and if needed I had a different position for my feet and legs. Hope this helps. Love my bags. Yes, you can use you passenger pegs. When you install the panniers you have to drill to install the bracket, this means you can choose the location. I put mine as far behind as possible so that they won't get in the way of my passenger's legs. Yes, I still routinely ride two up on mine, just make sure that you have your passenger sit on the bike while you mark the boxes for mounting to the racks. If mounted using the supplied directions there is no problem with the passenger pegs. yes it has no effict on the pegs. 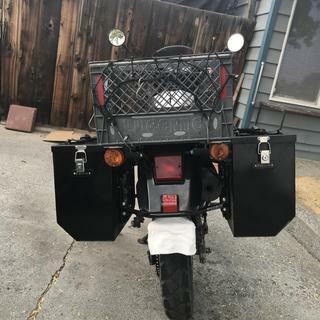 Do you need to move the tail lights to mount the racks on a 2017 KLR650? Are the brackets included with this set or sold seperate? BEST ANSWER: Everything you need to mount these to a KLR is in the kit. The tail lights will be relocated slight further back and they provide the mounts to do this with. You shouldn't need anything but to re-route those wires slightly. Everything is in the mounting kit with the written instructions. On my 05' which should be the same as yours, you don't have to move the tail light. The turn signals have to be moved, but they include a couple of turn signal mounting brackets. The kit really is all-inclusive. Yes ,you do remove the tail lights . New brackets are ncluded for relocaton as well as some electrcal wire if you need it. The relocation of the lights are very minor process. If you are referring to the signal lights, the answer is you do not. If you choose to the brackets are included but there is sufficient wire under the seat. Turn signals must be relocated, taillamp stays in stock location. Brackets do come with the kit. Very easy installation. No the tail light will be just fine in the stock location. I did make a little "L" bracket and moved the turn signals. Nly rear turn signals need to move. Does not affect tail light. Brackets are included. Simple to move turn signals. The tail light need to be moved to mount the racks, all nessary hardware is included to relocate the lights. Yes, you need to move the lights. The kit comes with brackets and extra harness wire. super easy. Yes and they mount to the brackets themselves...no extra parts needed. Super easy. BEST ANSWER: Mounting on the side is fine though I wouldn't mount anything larger than a 1 gal. Rotopax out of consideration for the weight. Rear mount is also possible depending on how you position the panniers. The other thing to consider with side installation is width. The large panniers have about the same width installed as the KLR's handlebars. With the Rotopax on, you can't use that as a guide. I mounted the one gallon Rotopax containers on the side of the Tusk boxes. They mounted solidly and carry very easily with my camping gear mounted on the rear of the seat and luggage rack. They can be attached quicky and removed with a twist of the handle. Shouldn't be any reason you wouldn't be able to mount them to the outside or back - I'd probably be sure to use some large fender washers to spread the load of the fuel/water you have on there. No problem at all. Plenty of flat surface on the panniers for the Rotopax mounts or touratech bottle mounts. What is the recommended maximum load for the 37L panniers? No maximum weight was recommended in the instructions. Same question to other riders, what was the maximum weight you loaded on your large panniers? These panniers and the racks are pretty sturdy. I have only used them on overnight trips, so my loads have not been huge, but I would guess I have packed about 50 pounds total in them with plenty of room and no concern about them breaking. Not sure if I answered your questions, but these things are pretty bomb-proof. I just thought of it like I had a second rider.... I just filled them up and used them never worried about it! I mounted mine pretty low because I knew I'd be loading them up.. Total weight never really cared. Hope this helps. No idea. But I have carried tools, couple litres of oil, chain lube, compressor etc so both were packed and have never had an issue. I've never weighed them after loading them down with a few days of gear. I've never felt that they were over loaded. Do your racks stick out an equal length on both sides when mounted on a 2015 KTM Adventure R? I have the BMW 1200GS and they are equal on both sides. I'm not sure on the KTM. By the way, I've had them over a year and they are great panniers. I'm glad I bought these over those high priced ones. Mine are symmetrical on my 2018 SAR. Clearance on the right for the exhaust and the clearance on the left allows for the mounting of a RotopaX can (up to 1.75, I think). Do you sell racks that fit the Honda CB500X? 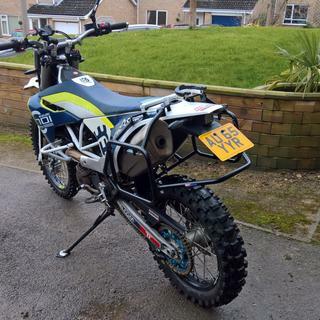 Looking at converting my bike to more dual sport with the Rally Raid 3 kit. 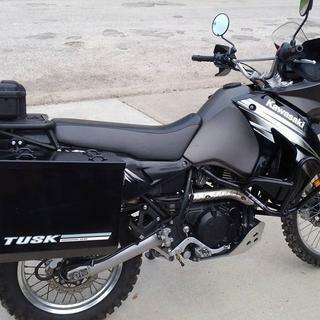 Would like Tusk panniers if the Tusk rack would fit my bike. Thanks. Will. BEST ANSWER: I looked into this and unfortunately we do not carry Tusk racks that will fit your machine. Thank you for your suggestions. We will send this along to our purchasing department for consideration. 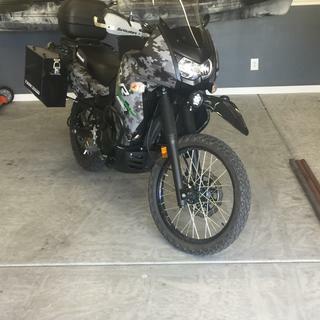 Will these fit 2017 Versys 300? BEST ANSWER: Unfortunately, we do not have a rack system that will fit this machine. However, our panniers are a universal fit and can fit on any rack. Do these fit a NC700X DCT? 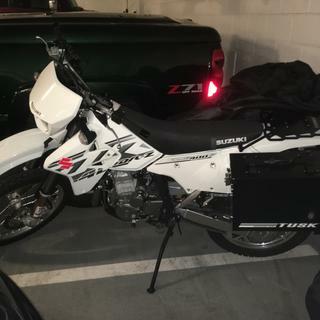 Where it says tusk on the side, is that a sticker that can be easily removed or am I gonna have to take acetone to a brand new set of panniers? BEST ANSWER: The set I had was a sticker. Should come off easily with a heat gun. Acetone Probably would not harm the powder coating finish. Decent cases for the money. Good luck. I picked at the sticker on mine a little bit; it is on pretty good. You will probably need to use a heat gun and acetone to remove the TUSK stickers. definitely easy to remove. set in the sun or heat with a hair dryer, peel off slowly, and you'll have no problem with adhesive residue. Yes, it is a sticker and peels off very easy. I have the silver boxes and removed it on mine to install DOT reflective tape. I never bothered to try. However, it is a sticker and not under any clear coat as I recall so removal shouldn't be too bad. Before I tried acetone or another solvent I would maybe try heat gun first. Haven't bothered removing mine. Use heat when removing the sticker. DO NOT use acetone to remove adhesive residue, USE mineral spirits. It is a sticker, easily removed. IIRC they weren't applied to the panniers but just included in the box. It’s just a sticker, I Think you have to put it on because it comes seperate inside the box. I don't know if the sticker will come off easy. I saw no reason to remove the sticker. Just a sticker. I didn't remove but see no reason why it couldn't accomplished easily. Peeled the sticker right off and stuck it on my tool box. Just a sticker. I easily peeled mine off in one piece. it will be a sticker. i have seen where some panniers can be used as supports for the bike for repairs along the trail. can these hold up to the weight of a fully loaded klr650? aka: holding the bike off the ground to remove a tire/rim assembly. BEST ANSWER: I WOULD HAVE TO ADVISE AGAINST USING THEM IN THIS MANNER UNLESS YOU ABSOLUTLY HAD TO.HOWEVER LET ME SAY THESE ARE WELL WORTH THE PRICE.I HAVE PAID MUCH MORE FOR SIMILAR PANNIERS AND THESE ARE EVERY BIT AS GOOD IF NOT BETTER!!!! 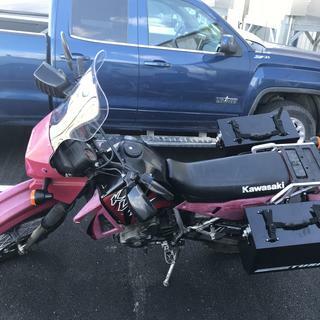 I have these on my KLR as well as my KTM 1190 Adventure R. I think the rack would support the weight of a bike but would be skeptical about jacking it up using the actual pannier. I took a big hit with my 1190 and deformed the actual pannier but was able to bend it back, mostly, by hand. I have both big and small pannier sets and I have reinforced the interiors baking plate area with aluminum plate to make them more sturdy. I just took a big hit on a Joshua tree on my 1190 yesterday with no ill effects. If you use these make sure to properly torque and loctite the subframe bolts. Honestly my KLR has an aftermarket center stand which balances the bike and is adjustable for different tire heights. It has worked well for me for over 2 years and I put it on for chain maintenance as well as tire changing. Final note, you cannot go wrong with one of these pannier sets for luggage. They are well built and inexpensive.That is why I have them on both bikes. If you do damage the set you can buy a whole set for less than one pannier book from other manufacturers. maybe i should have been a bit more specific. but what i have seen is the panniers one each side "on the ground" under the bike. not using the mounts in any way. a 2X4 between? or direct contact with the under frame? but only as a way to do a trail fix, not home shop work. from the sound of one video on u-tube the boxes sound solid, not flimsy. but a couple videos the panniers did take quite a hit and kept on working. I have a center stand but most defiantly they could take the weight of the bike. I wouldn't suggest placing a stand under the pannier as it's designed the hold weight down on the rack. But you could defiantly use he rack as a place to lift or pull. I have used the racks to ratchet strap myself up an imbankmemt and they held up just fine. 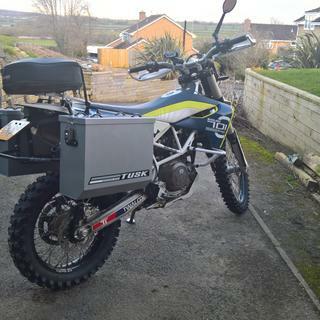 The tusk panniers are pretty rigid (I have them on my DR650). 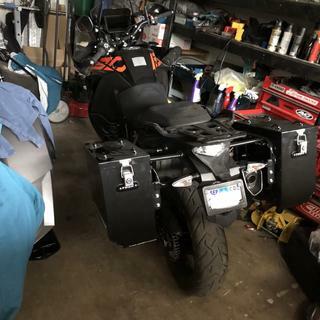 I'm not entirely certain you would want to try to lay a fully loaded KLR over on them at least not without a bit of bracing above and below to keep the sides from bowing in; pretty much like any other aluminum panniers, save for possibly some of the higher end ones. YMMV. I've never tried that ! I'd put something between the bike and the box ie towel or jacket , just to keep from scratching the paint . The panniers are strong enough , I'd think . I tried to knock the left box off the KLR with a " Tree " , didn't work , scratched the finish/paint and made a small dent . Battle Scar ! I have not used the racks for this purpose. That said, we were riding the trails and rain moved in unexpectedly. The dirt turned to mud. I ended up laying the bike down 3 times before getting to the truck. There was some small scratches on the boxes, but beyond that, there is no damage. I was impressed. To be honest I'm not sure. I don't know if I would risk it. Especially since they have that angle to them. ( stability being the issue there). I would suggest getting an old crutch and cut it so you can use it as a trail jack. The supports are very solid and I think would hold the weight of the bike. Although on the KLR they sit pretty high off the ground. A center stand or simply leaning the bike over would be a better option for fixing a puncture. Not recommended. The pannier would support the bike in an emergency situation, but you will dent, scratch and damage the pannier and the support system. Will the large tusk panniers fit onto a SW-Motech rack? Would say there is a 99% chance they will, they come undrilled for hardware which allows you to mount them in your preferred position horizontal, vertically. Theres no reason it wouldn't as long as you have the corresponding SWM pannier mount. You are drilling the holes so its pretty much universal. I believe they would.The back of the panniers has no holes in it so you can mount them in whatever position you prefer. Im thinkin you could rig it up no problemo eh dere bud! I have a 2017 KLR650 and I just watched the installation video. It states that the right side is designed so that the cover can be removed to service the air filter but the left side cover must be on the bike when the rack is installed. I'm left with the impression that the left side of the rack must be disassembled to service the battery. Is this correct? 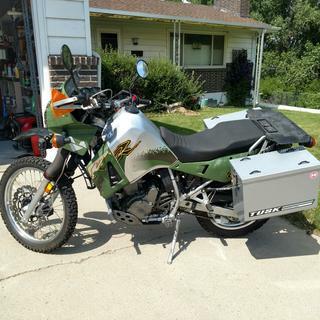 BEST ANSWER: I have the Tusk rack and pannier system on my 2016 KLR 650 and I'm able to remove both side covers for access without having to disassemble the rack. They can be a bit tricky to remove but a little twist here and there and they come out. This will give access to remove the seat and get access to the battery and air filter. You do not have to remove the boxes to service bike. They can get in the way of the socket wrench when removing bolts though. Boxes are easy to pull off as they do have a luggage quick disconnect on them. The mount that they mount to does not need to be removed at all for servicing. 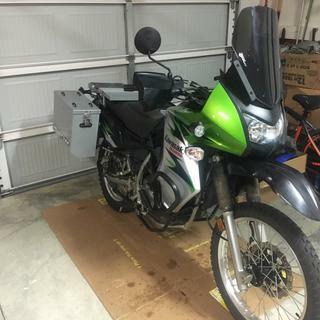 2015 klr with same boxes. Hi Kev, I have a 2006 Gen 1. But I can say that it is NOT required to remove the left side rack to service or remove the battery. Are the medium boxes tapered at the bottom of are they square like the old them paniers? BEST ANSWER: Not sure if my original answer went through. They are tapered. It's like the long edge has the corner cut iff. Mine have approximately a 2" bevel at the bottom on the outside-facing side of the panniers. thanks Doug. I'm sure the medium panniers are tapered as well. At least I hope so. Outside lower edge has a 45 degree chamfer. 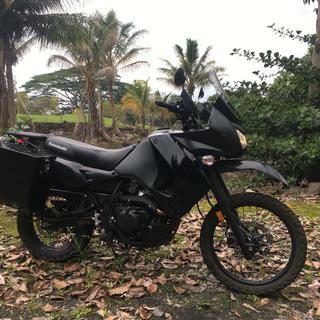 Are there any photos of the large panniers with the medium panniers for comparison (2017 KLR)? Looking to purchase a set but am trying to determine which ones to go with. BEST ANSWER: I purchased the smaller panniers to replace a more expensive set that had been beaten pretty well. In short order, I purchased a large set and what I found was that the small set are just that, small... And the large are, well... Large. The small ones are the right width on the 2nd gen KLR. They are within the handle bar width. The depth and length are proportionally too small so they don't visually look right. They are small as well which has resulted in a different load out for me when I travel. The large ones are well proportioned on length and depth, but are very wide. That said, if you're mainly dirt road riding, two track, fire road, etc riding, I like the larger. I'm able to get more into the panniers, which means less on the tail rack up high. I use them on longer hauls (week long and high miles). The small panniers are for shorter trips, 1 to 3 days, shorter milage. Also, I chose the silver panniers over the black. My first set of panniers we're black. The looked great on my red and black 2009, but not so much after the first time I had a tip-over. Scratches and gouges stood out like a flashing neon sign with the black ones. I opted for the silver on the second set of panniers and the third and fourth which are the Tusk panniers. I also really like the pannier racks, though they're heavy. For me, the quick release feature won me over. That said, I took a lot of filing and grinding to get the releases to work the way they're intended, but again, for the price, that was okay with me. The pannier locks work well. I prefer a captive lid like my original panniers have. With the Tusk panniers, it you leave one lock unlatched, you definitely run the risk of a panniers lid flying off as you're riding. Overall, with the value you get with these Tusk panniers, really, it isn't too hard to justify getting both the large and small to keep options open. I would definitely buy them again! Hope this was helpul. Safe riding. Thank so much for the information! I do not think there is a way to add photos to these questions so I will try to help answer your question. 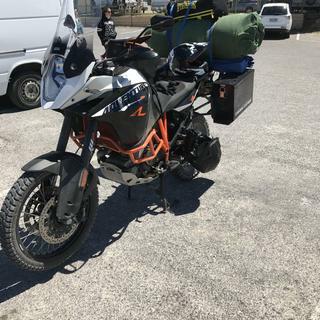 I have both size panniers which I use on my 2015 KLR and my 2016 KTM Adventure R. I have taken 2 week trips using originally the large panniers and later, with better packing, the medium set. I personally like the look of the mediums on both of my bikes and in some instances the large encourage overpacking. I later modified the large ones so I could carry a one gallon rotopax on top of each one. This I did for longer off road trips on the KTM. Thanks for the response. Likely going to go with the medium sized ones! 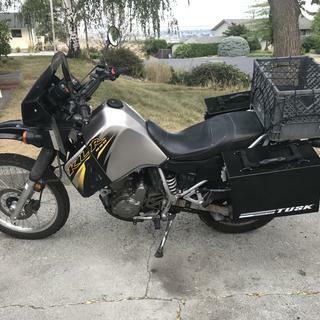 The only advice I can give you is: I purchased the small Tusk panniers for my '08 KLR. They're plenty big enough for that size bike. Thanks for the input. Leaning hard towards the smaller ones! If you are going to do any overnight or multi day camping trips you need the larger set. No pic but go with medium. I have large and they ar little to big. Thanks! Leaning towards the mediums. i apologize but we do not have a side by side comparison. 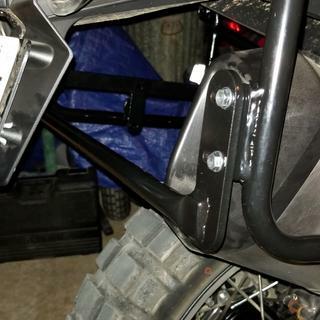 BEST ANSWER: I have them mounted to my 2016 KLR650 and have no problem two up. I did make sure there was room for feet on the rear pegs after I marked the location of the panniers but before I drilled the holes just to make sure. Not counting the seal, my first hole is 4 1/2" from the front, 2 1/4" from the top. I have the medium panniers. I seldom ride 2 up in my ‘08 KLRbut a time or two I did and there was no complaint about losing room at all. I have found these panniers to be of excellent quality and RMATV is excellent to work with. No. Just make sure when drilling holes for the bracket, have someone set on the bike , and keep the panniers to the low side. I installed them on my KLR 2016 and it works great. I mounted them on a 1991 KLR. No problem with being able to ride 2 up. Install the rack first, then position the boxes where you want them. I love the panniers, but I have not tried two up. Don't think I will. I have a 2016 Aftrica Twin, do the Tusk mounts require any modification of the bike, i.e., trimming body work or relocating turnsignals? BEST ANSWER: Can't answer your question. But I will tell you this ............ 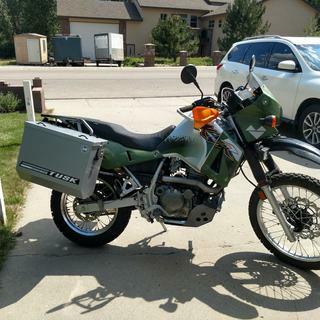 I have a 2005 KLR650 and bout the cans n mounts last year. They fit perfect. Just have a friend to hold the cans once you go to line them up on the mounting hardware so you can stand back from all angles to view how they look. Another FYI ... get the smaller cans it will help your heals out when you have to peddle thru the rough stuff. I bought the big ones n they take a toll on my heals n the slick. I just installed a set on my 2017 AT. You do have to drill into the rear fender from the bottom to get a spacer in, but that's all the modification to the bike that is needed. Rocky Mountain has a video on the install that is very straight forward that will answer this question better. The mounts are wide enough to clear the rear turn signals. No,all brackets fit bike perfectly.the stock turn signal wire were long enough,however tusk did supply wire to extend the wires.when we mounted panniers to bike we had mi wife sit on the bike to determine location of where to drill holes as to give her enough leg room with her feet on the pegs.Tusk panniers took us about 5-6 hours to install.This has been the best upgrade to our bike and carry all our riding gear. I cannot attest to the fitment on the AT but these fit great on my 04' KLR650, bolted on with minimal finagling of alignment. My kit required relocating the turn signals but the included brackets were adequate, with that said I utilized the opportunity to upgrade to mini LED stalk turn signal lights. 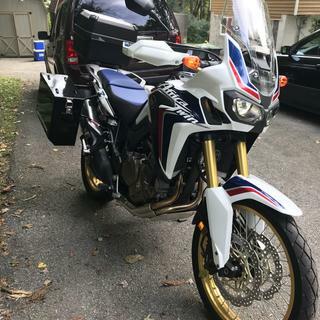 I own and have mounted Tusk Panniers to my 2017 Africa Twin. The only modification is to drill out the fender well to have access to mounting the bolts and spacers provided in the kit. All explained and shown in easy to follow instructions provided. 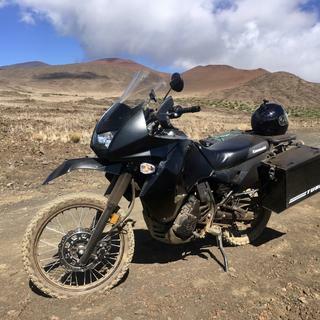 what top racks work with the panniers for a 2017 dr650? BEST ANSWER: I use a Pro Cycle top rack with Tusk panniers on my DR. I like that the Pro Cycle rack is wider than some, for strapping on a soft duffel. I have the moose expedition rack on a 2009 with these panniers and it works perfectly. 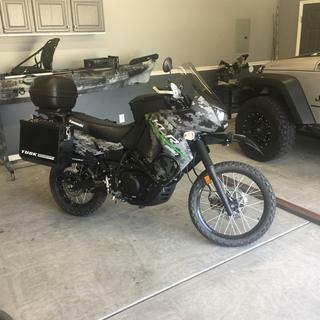 Will this system fit a 2012 Yamaha super tenere? Or is there a Tusk system to fit this motorcycle? BEST ANSWER: I would not count on the mounting bracket system to simply line up. 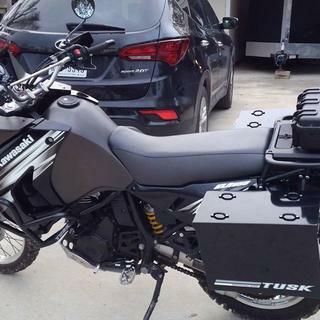 If Tusk doesn't offer the rack, and you can find a rack designed for the Tenere, then as long as the rack you find comes with mounting hardware for the boxes, then yes. The inside surface of the boxes is smooth and flat. I am traveling with serious weight in my set. Music and video equipment. Stupid weight - and they are working great. unfortunately this will not fit. this is a machine specific part. the bolt holes will be very different for your machine. thank you for your question!